The INARF Political Action Committee (INARF PAC) exists to further the influence of the INARF members who make up Indiana’s provider community. The PAC is a powerful advocacy tool which allows INARF to financially support incumbents and candidates who embrace INARF’s policy positions and serve as friends and champions of the provider community. INARF is committed to ensuring a sustainable service network that meets the needs of Indiana's citizens affected by developmental disabilities. The developmental disability service provider network strives to work collaboratively with other system stakeholders to ensure available resources meet the basic health and safety needs of those we serve. demonstrates that it is a resource for identifying efficiencies that permit the State to deploy its precious resources more effectively. As we look at the next two years, it is critical that we maintain or increase available funding, maximize Federal resources, and invest new resources and provider efficiency dividends into systems improvements and serving those on the wait list. ​Within this context, the developmental disability service provider network is focused on working in partnership with consumers and the state toward mutually beneficial solutions. You can also contribute* by postal mail using this form! *PLEASE NOTE: ﻿Voluntary contributions by individuals to the INARF PAC should be written on personal checks. Voluntary contributions from other political action committees are also permissible. Contributions from tax-exempt corporations cannot be accepted, and will be returned. 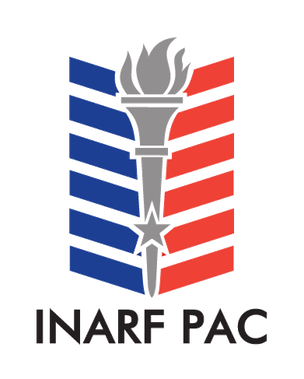 Donations to the INARF PAC cannot be claimed as a deduction for federal income tax purposes.